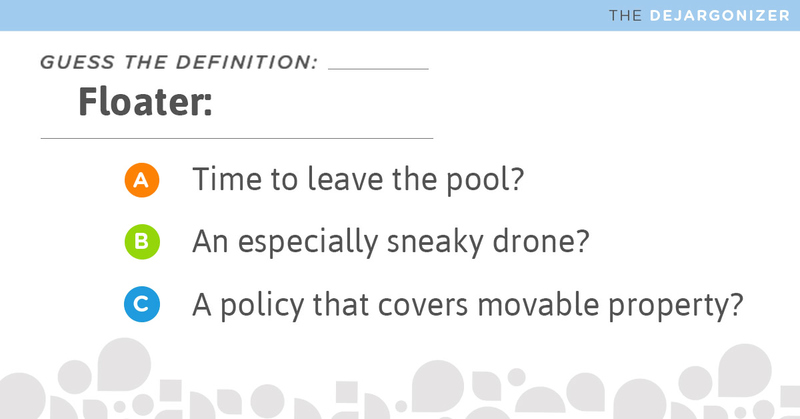 No, a floater isn’t something to run from … if you’re talking about insurance. In fact, it’s a really good idea to have a floater if you ever take expensive items like jewelry, cameras or business property out of your home or business! A floater is an insurance policy that provides additional coverage for items that are easily movable or recently sold. Fur Floater, Jewelry Floater and other Personal Articles Floaters: These policies add a few types of coverage for expensive personal items. They can cover an item while it’s away from your home or business. They can make sure an item’s full value will be replaced (including the full value of your pair of earrings if you only lose one). Or they can add coverage for mysterious disappearances (because your insurer isn’t going to let you blame it on the gnomes). Commercial Property Floater: Pretty much the same as a Personal Articles Floater, but for business property. This one’s important for any company that regularly moves expensive equipment around. Wedding Presents Floater: There are a few times in your life when you might receive a lot of valuable items all at once - such as your wedding (okay, your first one). This floater is a short-term policy that covers your precious gifts until you get them home. Warning: Some items like vehicles and cash may not be covered. Unscheduled Property Floater: To untangle the terminology, "unscheduled property" means items covered in your main insurance that don’t need to be individually listed (often furniture, clothes, equipment, etc.). A floater can be purchased to cover these items in situations where they wouldn’t normally be covered such as rentals and certain types of damage. Installation Floater: Covers personal property installed, fabricated or erected by a contractor. It covers the installed property and equipment being used until the installation work is accepted by the purchaser. So you don’t have to argue over who pays for theft or damages while you’re working at someone else’s home or business. Most people don’t know exactly what's not covered by their insurance policies, and you shouldn’t wait until something is lost or damaged to find out! Mylo’s licensed insurance advisors can answer your questions and tailor a package that’s right for you! Give us a call for a custom consultation.